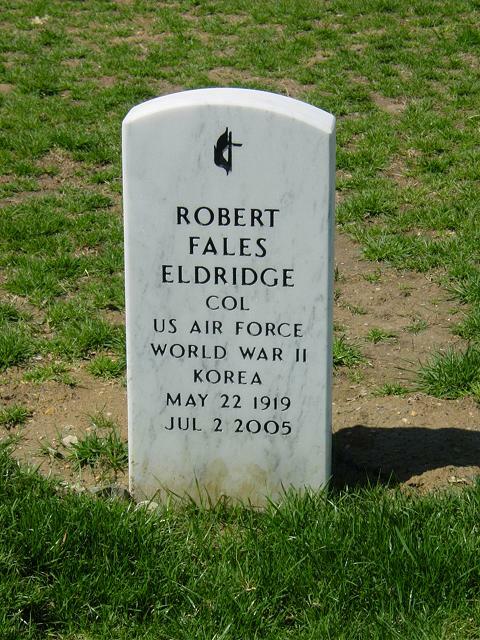 Robert F. Eldridge, 86, a retired Special Agent with the Air Force Office of Special Investigations, died July 2, 2005, at his home in Asbury Methodist Village in Gaithersburg. He had chronic obstructive pulmonary disease. Colonel Eldridge was born in Washington and graduated from Roosevelt High School in 1937. He worked at Bliss Electrical School while attending Columbus University, which is now Catholic University's law school. He received a bachelor's degree in law in 1940 and master's in law in 1941. He was inducted into the Army and commissioned after attending Air Force Officer Training School in 1941. He served in the 7th Air Force in the Pacific during World War II. He received several awards, including a Bronze Star for meritorious achievement in connection with military operations against the enemy from October 16, 1943, to June 14, 1945. He was recalled during the Korean War in 1950. He attained the rank of Colonel in the Air Force Reserve. After retiring, he remained in the Air Force intelligence office as a civilian until 1976. Survivors include his wife of 62 years, Mary Louise Eldridge; three children, Robert Eldridge Jr. of Boyds, Kenneth Eldridge of Cody, Wyoming, and Cheryl Craig of Gaithersburg; and four grandchildren. Louise Eldridge. Loving father of Robert F. Eldridge, Jr. (Barbara Jean), Kenneth P. Eldridge (Donna), and Cheryl A. Craig (Bruce). Grandfather of Jennifer Eldridge, Steven Craig, Sara and Matthew Eldridge. Also survived by one sister Janet Wesner. A memorial service will be held at Grace United Methodist Church, 119 North Frederick Avenue, Gaithersburg, Maryloand 20877 on Tuesday, July 12, 2005 at 2:00 P.M. Funeral Service will be held at the Old Post Chapel at Arlington National Cemetery on Thursday, September 15, 2005 at 1 p.m. Interment Arlington National Cemetery. In lieu of flowers, memorial contributions may be made in his name to The Air Force Scholarship Awards Program, Attn: Chuck Azukas, 8421 Chillum Court, Springfield, Virginia. 22153 or to Montgomery Hospice, 1355 Piccard Dr., Suite 100, Rockville, Maryland 20850.